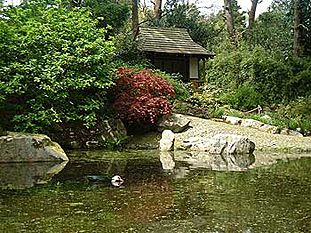 Pinetum Park is a 30 acre estate comprises gardens within a garden which hold a wide range of some 6,000 plants, all of which are labelled. In addition to rhododendrons, magnolias and camellias there are Mediterranean and southern-hemisphere plants. Herbaceous borders, a fernery, a formal garden, a woodland walk, shrubberies and a wild flower meadow. 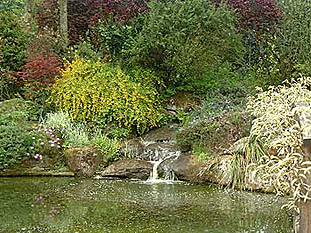 The water features include a wild life pond, an ornamental pond, a lake with an island and marsh gardens. Trees are also a speciality with a four acre Pinetum, an Arboretum and an acre Japanese garden. 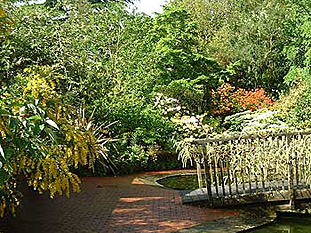 Our 30-acre estate, in its mild climate of mid-Cornwall, comprises several linked gardens. We have over 6000 labelled plants, many of which are rare or unusual. In addition to rhododendrons, magnolias and camellias, so familiar in Cornish gardens, there are Mediterranean and southern-hemisphere plants grown for all-year-round interest. Shirley’s planting schemes, renowned for their imaginative use of colour, ensure that you will enjoy the herbaceous borders, fernery, formal garden, woodland walk and shrubberies. Pine Lodge’s water features include; a large wild life pond, an ornamental pond with cascades, a lake with an island (home to black swans and many waterfowl), a newt pond and marsh gardens. Trees are also a speciality with an acer glade, a collection of 80 different conifers in a four-acre pinetum, and an arboretum. Many rare & unusual plants, all propagated at Pine Lodge, are sold in our Nursery. Travelling into Cornwall from east of Exeter, the most convenient route is on the A30. From the M5 after Exeter, take the A30 towards Okehampton. Continue on this road, passing Bodmin, and then turn left onto the A391 to St Austell. Turn right at the Traffic Lights onto the A390. You will see the signs for Pine Lodge Gardens on the left-hand side. Turn into the entrance way and drive up the short lane. There is ample car parking. Travelling from the Plymouth area, take the A38 towards Liskeard. Continue on the A38 to Dobwalls and take the left turn onto the A390 to Lostwithiel and St Austell. As you approach the outskirts of St Austell, shortly after the traffic lights at the junction with the A391, on the left-hand side you will see signs for Pine Lodge. Turn into the entrance way and drive up the short lane. There is ample car parking. Travelling from the west of Cornwall, take the A390 which passes just south of St Austell town. Continue on this road through 3 sets of Traffic Lights. You will shortly see a Brown Sign for Pine Lodge Gardens which is on the right-hand side of the road.